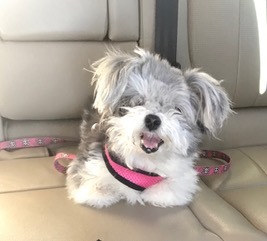 Minnie is a tiny shih tzu poodle mix who we picked up at the shelter. She is as cute as a button and very sweet and friendly! She is 12 years old and a little chubby at 6 pounds. Minnie needs some “fixing up” before she is ready for adoption. She arrived at the shelter in bad shape. She had double ear infections, nails almost growing into her pads, mats pulling at her skin, and infected teeth. She is being treated with medicated drops for her ears and antibiotics to help with her infected mouth. She goes for x-rays and dental surgery next week and will be ready for adoption once she has recovered from everything. Despite all of her medical issues, Minnie is a happy and lively girl! She loves to snuggle and sit in your lap. She walks well on a leash and rides quietly in the car. Minnie would do best in an adult household with someone who can spend lots of time with her. She is itty bitty, so no big/active dogs or children, but gentle cats would be fine. 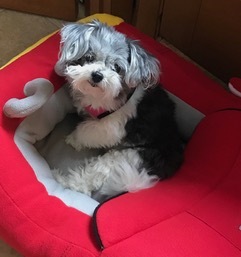 Minnie looks like a little stuffed animal and has an adorable personality to match her look. Just looking at her will make you smile and watching her run around will warm your heart. If you are interested in giving Minnie a forever home (adult only with someone around for most of the time, no children, no big or active dogs) please fill out an online application by clicking the Adopt Me button below. Minnie’s adoption fee is $350.